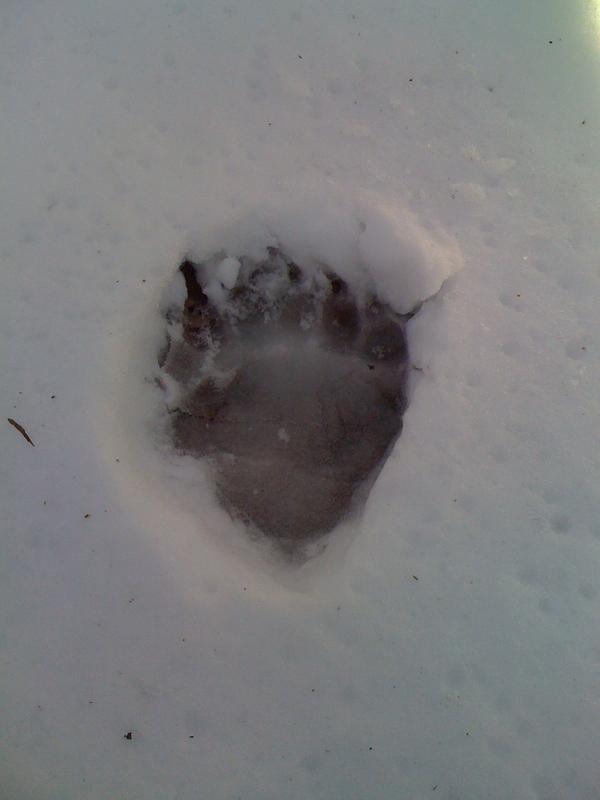 For those of you who don’t know, that’s a bear track. The picture was taken two days after Christmas in the woods behind my Mom’s house in Pennsylvania. When I was growing up, there were no bears there. When my mom was growing up, there were no bears there. Now, there are bears. Well, at least one bear. I find it…unsettling. As an adult I have discovered that I am only OK w/ scary animals to which I became inured during my Appalachian childhood. Copperheads, OK. Rattlesnakes, OK. Cobras, so freaking not. Coyotes, I am working on, as there is a whole pack living in the field behind my current house, and they howl like mad when I am out walking the dog at 11pm. But bears? Seriously, that’s the kind of thing I read about in Reader’s Digest ‘Drama In Real Life’ when I was 9: “…and then the grizzly just put my entire head in her mouth, and I realized that the crunching sound was actually my skull breaking under her terrifying teeth…” It seems the world is always changing, and not necessarily in the direct I expect. New Year, New Blog. Maybe. It’s been a while. I’ve been busy. Crying, mostly. More sitting in a chair reading books I want to read. More writing. I got Scrivener. It’s great. I revised a story on it in Nov-Dec and while, sadly, it didn’t do the writing for me (which I knew it wouldn’t, but still pathetically somehow somewhere deep down kind of secretly hoped it would). I didn’t end up using all the meta-data stuff while writing like I thought I would, but it was great for working my way back into the story while revising, tagging things and organizing my thoughts as I started to pull it apart. I’m a messy thinker, and anything that helps with that is fantastic.